Vitamin & mineral tablets for all of pregnancy. Bulking Agent: Maltodextrin, Magnesium Oxide, Microcrystalline Cellulose, Vitamin C (Ascorbic Acid [Carriers: Hydroxypropylmethylcellulose & Tartaric Acid]), Ferrous Fumarate, Tablet Coating (Hydroxypropylmethylcellulose, Hydroxypropylcellulose, Capric/Caprilic Triglycerides, Natural Source Colours [Titanium Dioxide, Iron Oxides], Glycerin, Purified Talc), Zinc Sulphate, Anti-Caking Agents: Silicon Dioxide, Stearic Acid & Magnesium Stearate, Niacin (as Nicotinamide), Vitamin B6 (Pyridoxine HCl), Betacarotene (Carriers: Starch, Water, Antioxidant: DL-Alpha Tocopherol), Pantothenic Acid (as Calcium Salt), Vitamin B12 (Cyanocobalamin [Carriers: Maltodextrin, Trisodium Citrate, Citric Acid]), Vitamin E (D-Alpha Tocopheryl Acid Succinate) (from Soya), Vitamin D3 (Cholecalciferol [Carriers: Acacia, Sucrose, Corn Starch, Medium Chain Triglycerides, Antioxidant: DL-Alpha Tocopherol]), Thiamin (Vitamin B1 as Mononitrate), Riboflavin, Copper Sulphate, Vitamin K (Vitamin K1 [Carriers: Acacia & Sucrose]), Folic Acid (as Pteroylmonoglutamic Acid), Potassium Iodide, Biotin, Sodium Selenate. Allergy Advice: For allergens, see ingredients in bold. You can take Pregnacare during all stages of your pregnancy. This comprehensive formula replaces other Pregnacare multivitamins. There is no need to take an additional multivitamin. As Pregnacare contains vitamin K, if you are taking oral anticoagulants do not take Pregnacare except on the advice of a doctor. Why has Pregnacare been developed? What do I need to know before starting to use Pregnacare? Can Pregnacare be used alongside medicines? How many tablets does one pack of Pregnacare contain? How and when should Pregnacare be used? 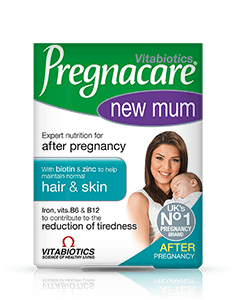 Are there any undesired effects whilst taking Pregnacare? Some Nutrient Reference Value (NRV) levels are above 100%. Is this safe during pregnancy? 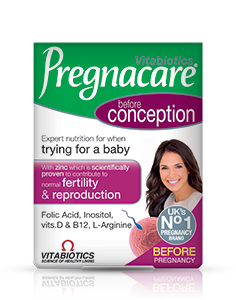 Does Pregnacare contain Vitamin A (retinol), because excess may be harmful during pregnancy? I have been recommended by my midwife/G.P. to take a supplement containing 400 mcg of folic acid per day, only for the first 12 weeks of pregnancy. Is it safe to take a supplement containing folic acid (like Pregnacare ), after this time? What happens if I forget to take my Pregnacare and miss a day? During pregnancy, your baby is totally reliant on what you eat as their only source of nourishment. So even with a good diet, extra specific nutrients may be very important around the time of pregnancy. 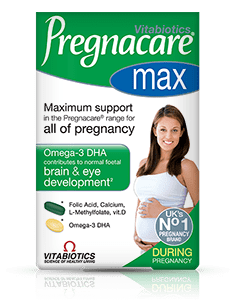 Pregnacare has been specially formulated so mothers-to-be can safeguard their extra dietary requirement without confusion about which supplements to take. 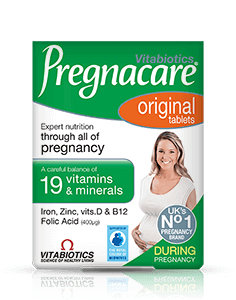 Pregnacare contains a careful combination of 19 vitamins and minerals, including vitamin B12 and folic acid. 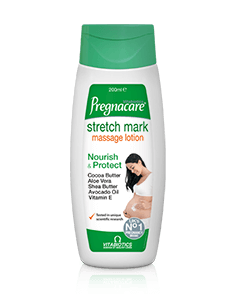 Pregnacare is recommended as soon as you start trying to conceive to help safeguard your nutritional needs before you find you are pregnant; throughout the whole of your pregnancy and also whilst breast-feeding when extra demands are placed on your body. 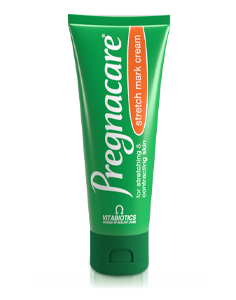 Pregnacare can be used for as long as required and can be started at any point during pregnancy. Pregnacare has been carefully developed by a team of medical experts including highly qualified pharmacists and medical consultants, is based upon solid scientific research evidence, as a nutritional safeguard for women from before conception and all throughout pregnancy. 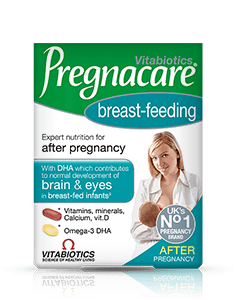 Pregnacare is a multivitamin and mineral dietary supplement formulated to safeguard the nutritional needs of mother and baby. Pregnacare replaces your usual daily multivitamin. Your doctor may wish to prescribe an additional iron supplement after the 13th week of pregnancy, which may be taken with Pregnacare. As a general rule, Pregnacare can be taken alongside medications because it contains only moderate levels of vitamins and minerals. However, if you are already taking prescribed supplements or medications, seek advice from your doctor or health professional first. As Pregnacare contains vitamin K, if you are taking oral anticoagulants (blood thinners) do not take Pregnacare except on the advice of a doctor. Pregnacare is available in 30 tablet (1 month's supply) and 90 tablet (3 month's supply) packs. It is recommended to take one tablet per day. One tablet per day is recommended with or immediately after your main meal, with water or a cold drink. Taking the tablet with a large meal maximises the absorption of the nutrients and can reduce nausea which is sometimes experienced if multivitamins are taken on an empty stomach. Pregnacare should only be taken on a full stomach. 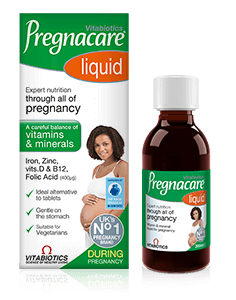 Always ensure that Pregnacare is taken with plenty of liquid to wash down the tablet. We do not recommend chewing the tablets because they have not been formulated as chewable preparations. Chewable tablets usually include flavourings, sweeteners and/or added ingredients to help break the tablet up in the mouth. 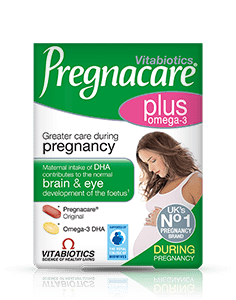 Pregnacare tablets are suitable for vegetarians. Pregnacare has no known side-effects when taken as directed. Do not exceed the recommended tablet intake. In case of overdose, seek medical advice immediately. NRV levels are calculated to help prevent the most basic vitamin and mineral deficiency states. The levels contained in Pregnacare are specific to normal requirements in pregnancy. This is why some levels of nutrients in Pregnacare are higher than the NRV (e.g. folic acid, the recommended level is 200% NRV). Importantly, all levels are safe for pregnancy and well within upper safety guidelines for daily self-supplementation. 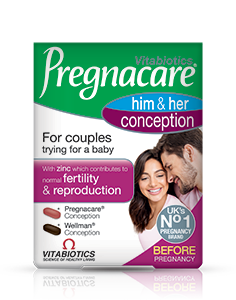 Pregnacare does not contain any vitamin A in the multivitamin tablet which has been carefully formulated specially for pregnancy to contain a moderate (non-excessive) level of betacarotene (provided as natural mixed carotenoids) instead of vitamin A. Betacarotene (pro-retinol) is converted into vitamin A naturally by the body as required, it is safe and suitable for pregnancy. It is perfectly safe to take 400 mcg of folic acid per day throughout the whole of pregnancy. The U.K. Department of Health's Chief Medical Officer recommends that women planning a pregnancy should take a supplement containing 400 mcg folic acid daily, from the start of trying to conceive until the 12th week of pregnancy. Folic acid plays a role in the process of cell division and contributes to maternal tissue growth during pregnancy. Folic acid on its own or within Pregnacare may therefore be taken throughout pregnancy. Pregnacare gives the advantage of not only providing folic acid, but other essential nutrients as well. A regular intake is recommended, but don’t worry, this will not have done any harm. Simply take Pregnacare on the next day when you remember and take as directed. You should not take more than the recommended amount on subsequent days to make up for any day(s) that you have missed. Whilst it is important to take a supplement every day, if you miss one day this is fine because the beneficial effects of the vitamins and minerals build over time. Difficulty in swallowing tablets is quite a common experience. Vitabiotics have researched this extensively, trying different methods and hope that our tips will help you swallow tablets with ease.